A controller can’t be perfect for all, but it sure can hit the important aspects of a quality gaming experience. And this is exactly why we decided to review the SteelSeries Stratus XL controller. There are many problems and annoyances that can arise when it comes to gaming controllers. A controller may work well with Windows, but be a pain to use with a VR headset, for example. Some controllers may work fine in general, but are built with materials that make the controller feel like a knock-off. Nobody likes to hold a cheap plastic controller, right? The SteelSeries Stratus XL looks to solve this problem by giving you what’s important in a gaming controller: compatibility with most devices on the market, great controls, one that is built with great materials and is easy and natural to use. In this review, we’re going to cover both the good and the bad things related to this controller… so let’s not waste a single second and instead let’s get this started! When it comes to quality controllers, SteelSeries doesn’t disappoint. You’ll find everything you could possibly want in a wireless gaming controller. Compatible with Windows machines to Oculus Rift headsets, you shouldn’t run into many problems pairing your SteelSeries gaming controller with a variety of devices. One major selling point for the SteelSeries Stratus XL is the sheer number of devices that can be paired with it. Enjoy playing games on your Android phone but hate touchscreen controls? Just plug the SteelSeries Stratus XL controller in and you’re good to go! The SteelSeries controller is also good for Steam big picture mode, Oculus Rift, the HTC Vive, Samsung Gear VR, Android phones and tablets, and Windows gaming. You have a ton of options for sure! Name any platform, and it is almost guaranteed that the Stratus will pair with it. Usually controllers will give you a hassle when plugging into less popular devices. We found the case to be false with the SteelSeries Stratus controller. Just about every device pairs very nicely and easily. If you’re into mobile gaming, you’ll find that a surprising amount of mobile games are compatible with this SteelSeries controller. This is a huge plus if you’re a fan of mobile gaming and hate touchscreen controls! One complaint with any kind of gaming accessory is how annoying cords can be. Not only do they get in the way, the chord itself can get damaged, which can ruin the responsiveness of buttons, among many other annoying issues. 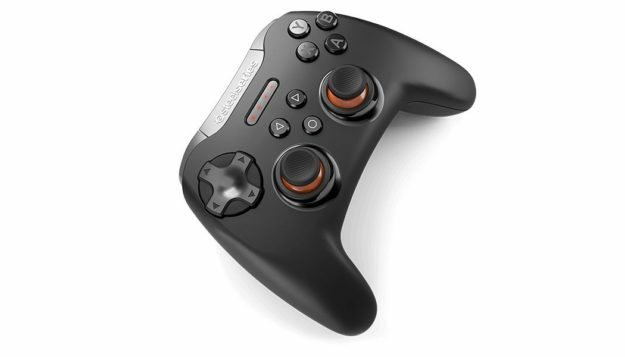 Luckily, the SteelSeries Stratus XL controller has Bluetooth compatibility. We found that pairing with the various gaming devices is pleasantly easy and the signal is strong, with no noticeable delays. Overall, this controller will hardly give you any problems. As far as wireless controllers go, the SteelSeries controller should pair with just about any device that happens to be laying around. No worries about using those annoying cords! Comfort may seem like an afterthought when purchasing a controller, but it can be more vital than you think. Think about how much time you spend holding the controller! Think about how many buttons you press when playing your games. You probably press hundreds of buttons every few minutes. You need something that feels natural to use. Something easy on your fingers. 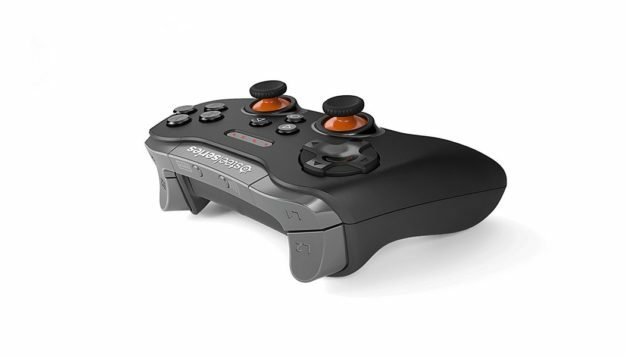 The SteelSeries Stratus controller contains tight, tactile buttons that won’t get stuck. On top of that, the materials used are very durable, which give the controller a solid feel. Nobody wants to hold a wimpy controller! A common concern with gaming controllers is how worn out a thumb grip cover can get. The SteelSeries controller comes with stock thumb grip covers that are extremely grippy and durable. No worries about slippy fingers that can make shooter games very frustrating! Overall, we were pleasantly surprised with how comfortable this controller was. It’s much easier to get immersed in a video game when your controller isn’t giving your hands nasty aches. On top of how comfortable a controller is, the quality of the materials is just as important for an optimal gaming experience. When you hold a controller in your hand, you want it to feel good. If you’ve ever bought a knock-off, you know how “plasticky” a controller can feel. Not only does it not feel right, many problems can arise. Buttons will get stuck and thumb sticks will lose their grip within weeks. You want buttons to feel tactile and accessible. You also should be able to feel the weight of a controller. Invested gamers spend lost of cash on controllers for a reason. A controller with quality materials will allow you to play games the way they were intended. Buttons should never get stuck, thumb sticks should have optimal grip, etc. The SteelSeries Stratus XL does a good job when it comes to having a gaming controller with optimal materials. On top of that, the materials are top notch for the price range. If you’re looking to get the feel of a professional controller without spending a hundred dollars, the controller’s build quality is a huge plus. A common complaint with stock PlayStation 4 controllers is the lack of battery life. A controller should be able to go at least a day without losing its charge. The SteelSeries gaming controller goes a step beyond. You won’t find yourself constantly charging your controller, which is great for those extended gaming sessions. Another big plus is not having to worry about charging your controller every night. If you own a stock controller, chances are, you have to worry about keeping your controller plugged in. You’re not perfect. You can’t always remember to plug in your controller every night. There’s nothing worse than coming home from work excited to play your favorite game only to realize that your controller has 20 minutes of battery life remaining. With the SteelSeries Stratus XL controller’s long battery life, many annoyances like this can be alleviated. The SteelSeries Stratus XL is a fantastic general purpose controller, as we’ve seen already, but it has some potential cons as well. 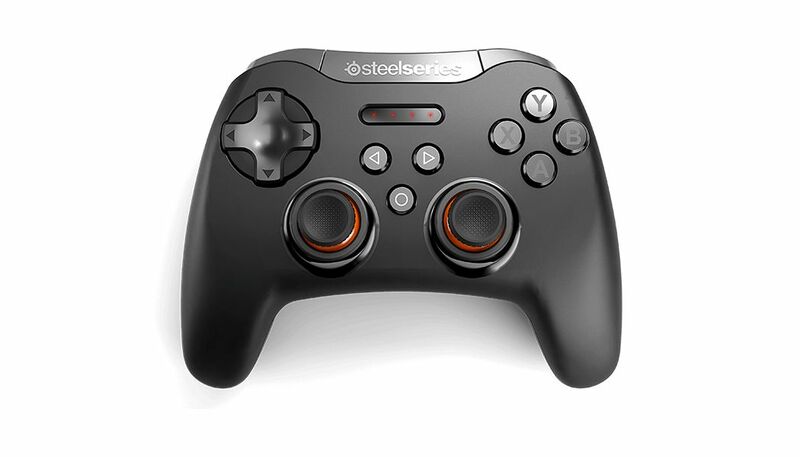 You could purchase a controller specifically for Android gaming, but the SteelSeries Stratus XL controller can pair with Android devices perfectly fine. On top of that, a versatile controller can make your gaming life more convenient and even save you some precious money. You may be pleasantly surprised with how little downsides there are with this controller. The SteelSeries Stratus controller can’t be charged, but batteries can be. It may look bad since you’d have to replace batteries every here and there, but buying rechargeable AA batteries isn’t too complicated or pricey. SteelSeries uses AA batteries to power their controllers. The controller has a USB slot that can’t be used to charge the controller. If the batteries run out of juice, you either have to replace the batteries or recharge them. Batteries do cost a few bucks, but they tend to last quite a while. The controller’s long battery life counters this downside since you don’t have to worry about charging the controller all of the time. If you really don’t want to keep repurchasing batteries, you can always buy a battery charger. Charging batteries is just as easy as charging a controller, so no worries there! If you like Bluetooth and can live without a corded connection, you’ll find the downsides to be insignificant. However, if you can’t see yourself using a wireless connection all the time, you may be a little disappointed with how the USB slot is designed. This can be both a good thing and a bad thing. If you love Bluetooth and can’t stop talking about it, this shouldn’t be a problem. If you’re not the biggest Bluetooth fan around, you may have some beef with being forced to use it. 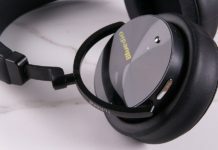 With the SteelSeries Stratus XL, you are required to have a proper Bluetooth setup on your gaming platform of choice. In many cases, Bluetooth is straightforward to set up and use. The problem is, it’s not always ideal. For those times where Bluetooth may not work, you’re stuck having to mess with config settings. You shouldn’t have to worry about this too much since Bluetooth tends to work well. Perhaps some of you just aren’t a fan of going wireless. If you’d prefer to use a cord once in awhile, you may be turned off by the required Bluetooth support. Wireless controllers are great, but we do understand the need to sometimes use cords. Overall, the downsides of the SteelSeries Stratus XL controller are only minor inconveniences. When it comes to the important aspects of a gaming controller, they hit the nail on the head. You can’t expect a gaming controller or any product to be perfect. If you looked over the negatives and thought nothing of them, the downsides will hardly affect you. The only real gripe with this controller is the required Bluetooth support. Bluetooth isn’t complicated, but it is a technology that can potentially have problems. Overall, the downsides, while a little annoying, won’t take anything away from your gaming experience. If you need a quality wireless gaming controller that can work with just about every gaming platform, this controller is for you. If you have needs that range from Windows 10 gaming to HTC Vive, the SteelSeries Stratus XL will serve you well. The SteelSeries reaches out to a large array of gamers with their versatility. Most gamers can really benefit from a versatile gaming controller. Gamers also want a controller they can use for their consoles, personal computers, and mobile devices. You shouldn’t have to purchase a separate controller for each platform. Chances are, you can benefit from having a SteelSeries Stratus XL laying around. 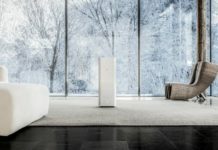 Xiaomi Mi Air Purifier Review: Is It Worth Buying? 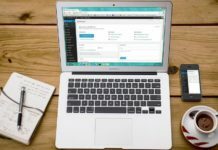 WordPress Gutenberg Impressions: Is It that Bad? Techosaurus Rex is a participant in the Amazon Services LLC Associates Program, an affiliate advertising program designed to provide a means for sites to earn advertising fees by advertising and linking to amazon.com.